Will replace sloppy old worn out camber arm for a high quality adjustable unit. Made out of high Anodized Aluminum. Front Camber Kit. Rear Camber Kit. 1996-2000 Honda Civic All models. Kit Includes International & Oversea after you have paid. When you had lowered your vehicles, It usually will cause your tires to suffer from increased wearing and tearing. By installing these, it will help improve tire wear and gives you better control on your overall performance while turning. 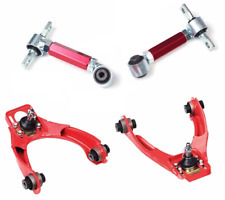 Camber Arm Kits will allow your vehicle to remain at the lowered ride height while correcting the angle of the tire closer to the spec it was suppose to be. 2006 - 2015 Honda Civic. - 2012 Honda Civic. 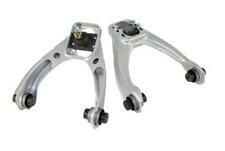 These rear upper Camber-Arms are adjustable to fine tune your cars handling in the rear. When lowering a car, these will eliminate premature tire wear caused by the rear wheels riding upon the inside tread only. 06-15 Honda Civic / 13-16 Acura ILX. Our camber kits are designed to do just that. 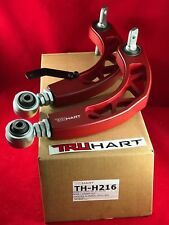 Truhart Camber Arm. 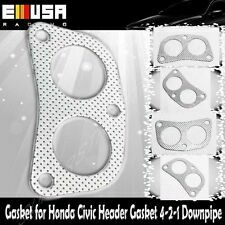 02-06 Acura RSX / 01-05 Honda Civic / 02-05 Honda Civic EP3 Hatchback. Our camber kits are designed to do just that. 88-00 Honda Civic / 90-01 Acura Integra / 97-01 Honda CRV. Our camber kits are designed to do just that. 88-00 Honda Civic / 90-01 Acura Integra / 97-01 Honda CRV. Our toe kits are designed to do just that. Our camber kits are designed to do just that. 88-91 Honda Civic / CRX. Trending at $261.49eBay determines this price through a machine learned model of the product's sale prices within the last 90 days. Our camber kits are designed to do just that. 96-00 Honda Civic. Our camber kits are designed to do just that. 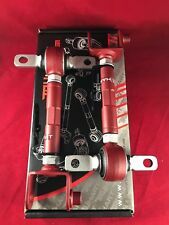 92-95 Honda Civic / 94-01 Acura Integra. 1992-2000 Honda Civic models. 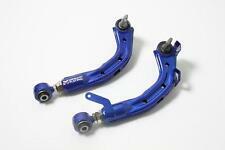 These rear upper Camber-Arms are adjustable to fine tune your cars handling in the rear. When lowering a car, these will eliminate premature tire wear caused by the rear wheels riding upon the inside tread only. Enthusiasts who are serious about performance can now correct almost all abnormal tire wear due to negative camber and increase high-speed stability. Each Tuner Series Camber Kit includes Skunk2's classic, one-piece, forged ball joints that feature a unique square-washer design for no-slip performance, reduced bolt distortion, and increased durability. Application: 88-00 Civic / 90-01 Integra. Available in both hardened rubber or spherical bushings. Old worn and tired bushings will drastically reduce the feel and handling of your car. Replacing worn bushings and suspension components can really make an older car feel new again. Our camber kits are designed to do just that. 1988-1991 HONDA CRX MODELS ONLY. 1993-1997 HONDA DEL SOL MODELS ONLY. 1990-1993 ACURA INTEGRA MODELS ONLY. 1994-2001 ACURA INTEGRA MODELS ONLY (DO NOT FIT TYPE-R MODELS). 1988-1991 HONDA CIVIC MODELS ONLY. In 2000 we pioneered the use of a one-piece forged ball joint. 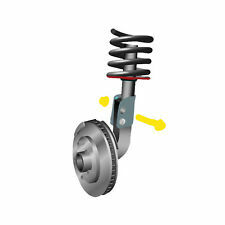 And in 2004 the [patent pending] Pro-Series ball joint was introduced. Available in Pro-Series Plus, Pro-Series, and Tuner Series. The Pro-Plus camber kit also includes 3-piece low-deflection polyurethane bushings that dramatically improve handling response, feel, and performance. Enthusiasts who are serious about performance can now correct almost all abnormal tire wear due to negative camber and increase high-speed stability. Each Tuner Series Camber Kit includes high-quality rubber bushings and Skunk2's classic, one-piece, forged ball joints that feature a unique square-washer design for no-slip performance, reduced bolt distortion, and increased durability. 1996-2000 HONDA CIVIC MODELS ONLY. ----- buy it now with lower price -----. We do not acceptCOD orLocal pick up. (Not available for bull bar / side step bars / bumper step / tonneau cover / racing seats.). Available in both hardened rubber or spherical bushings. Application: 92-95 Civic / 94-01 Integra. Cnc machined billet 6061 aluminum. Include hardware -- 2 x bottom sleeves & 2 x M12 x 1.25 pitch thread top mounting nuts.